20 April. Stations of the Cross for saint Peter: 14, Jesus is buried. His own people did not accept Jesus. Peter left Joseph to bury the Lord’s body; the disciples met together afterwards, but Judas did not come back. Scripture references: Peter’s betrayal: Matthew 26: 69-75; Waiting: Luke 23:56; 24: 9-11; Judas: John 13: 21-30; Matthew 27: 3-10. I was in total shock. My world had crumbled into pieces. I had said that I didn’t know my Lord. And my Lord was taken away; my Lord was killed. I was helpless. At least Joseph made sure that the practical things that had to be done, were done. I blundered off to our guest house with the others. no-one could speak. No-one wanted to eat: the bridegroom had gone. Still, we waited together. But Judas never came back. Let us pray that we may have the courage to persevere from day to day when life seems difficult or unbearable. Peter remembers the Olive Garden on Maundy Thursday when he has sliced off Malchus’s ear, and the heavily guarded garden around the tomb the next night. Scripture references: Malchus: John 18: 10-11; Luke 22: 47-53; Joseph of Arimathea: John 19: 38-42; Mary Magdalene: Luke 23: 55-56. Joseph had enough influence to get hold of the body and bury it. He had to be quick though. If he had been found still moving it when the Passover feast started there there would have been even more trouble. The guards were watching. They had taken over Joseph’s garden and even he could not send them away. Right down to that Malchus with his mended ear, they were ready to start on him if he put a foot wrong. They would have been glad to get their hands on a high-up like Joseph. He had to hurry Mary Magdalene away without doing everything properly. Let us pray for all who live in fear, whose lives are a mess, who do not feel they have done things properly. May they feel God’s forgiveness and love. Image from Missionaries of Africa. 18 April. Stations of the Cross for Peter: XII, Jesus dies. James, Stephen – and eventually Peter himself – were to die for Jesus. But this was a moment of desolation for his friend, the rock. Scripture References: Jesus the Carpenter: Luke 2:51-52; Mattheew 13: 53-58; Call of the Fishermen: Mark 1: 16-20; Call of the rich young man: Luke 18: 18-25; Stephen: Acts Ch 6-7; James: Acts 12:1-3.
this looks like the end of a wasted life. He could have carried on as a carpenter, and we could have stayed by the lake, catching fish all our days. Good, honest, useful work: absolutely nothing wrong with that. But Jesus said there was more to life than earning a good living. Sell everything, he told that rich lad, then come and follow me. We followed him, at times a long way behind and not knowing where we were going. Look what happened to Stephen and James! Stones and the sword, more blood on the cobbles. And yet Stephen saw Heaven opened, and Jesus there, with open arms, waiting. He is waiting for me, now. Jesus, remember me, when you come into your Kingdom! Let us pray for all who are facing a crisis in their faith or a relationship at this time, that they may be granted courage for the next step. 18 April, Maundy Thursday: Putting on an apron. Putting on an apron, as Jesus did: that can be as serious and solemn as giving one’s life … and vice-versa, giving one’s life can be as simple as putting on an apron. Blessed Christian de Chergé, Martyr of Algeria. Journey down, to then be lifted up. I am writing this at the beginning of Holy Week, the week in which Christians around the world recall the journey Jesus made into Jerusalem, and ultimately to his death on Good Friday and through to his Resurrection on Easter Day. It is a journey that takes him into Jerusalem, riding upon a donkey, that in itself being a sign of peace. He goes onto washing the feet of his closest friends (a job normally undertaken by a servant), before sharing a meal with them, and asking that every time they break bread and share wine together they do so ‘in remembrance of me’. During the meal he is betrayed by a close friend, and eventually arrested, before being brought before the High Priests, is flogged and then Crucified. For many this they thought was the end, Jesus was dead, only to discover that Jesus was in fact alive, he had risen from the dead on that first Easter morning. The tomb was empty, Christ had Risen! And was witnessed by over 500 people on 12 separate occasions. In our Baptism we die with Christ, so that we might be born again with Christ, a new life with him, and in doing so in the knowledge that in believing in Christ we too will have this eternal life (John 3:15). I often look at what nature tells us. In the autumn, when nights are drawing in we plant seeds into the cold dark soil, only in the spring to find an abundance of new life that has emerged from the darkness. Likewise, with the dawn chorus, when it is still dark, the birdsong announces a new day and ‘the light shines in the darkness, and darkness has not overcome it’ (John 1:5). As we approach Easter, we do so in the knowledge that we have to journey down, to then be lifted up; we have to walk with Christ through the depths of Good Friday, to be raised up high on Easter Day with our heads held high. Like a mother hen protecting her young, Christ died that we might live, and by believing in him we too have that eternal life, and all in the knowledge of God’s grace and unconditional love for each and every one of us. Wishing you all a Blessed Holy Week & Easter. Rev. Jo Richards is the rector at Saint Mildred’s Church in Canterbury, where L’Arche have our garden project. 11 April: Stations for Peter V: Veronica wipes Jesus’ face. You shall not wash my feet! Scripture references: Washing Peter’s feet, John 13:1-11; Do you love me? John 21:15-17. When Jesus washed the feet of his friends, Peter had protested. I didn’t want you to wash my feet. Was I too proud? I know I did not understand what you were doing – but I wanted to be part of you. Veronica washes your face with a cool damp towel. A few seconds’ relief, that’s all, but you know she loves you. She’s there. But you know that I love you – why did you have to ask? Lord, we remember everyone near death, and all those who care for them. May the dying, their carers, and all who are close to them know that you are indeed walking with them. 8 April: Stations for Saint Peter, Jesus takes up his Cross. Scripture references: Matthew 27:27-31, John 19:12-19; You will be led where you do not want to go: John 21:18-19. Jesus is left with no choices – he is forced to take up his Cross. there is nothing Peter can do now. Some weeks later, back by the Lake, Jesus would tell Peter: when you grow old you will stretch out your hands and somebody else will put a belt about you and take you where you would rather not go. No, I don’t want to be here, waiting for the soldiers to take me away. Will it be the lions or the gladiators or the cross? There’s only one way out of here, but I do know where I’m going! Let us pray for all prisoners awaiting death. May Jesus walk with them and welcome them into his Kingdom. 7 April, Stations of the Cross for Saint Peter, I: Jesus on Trial; Peter denies him. Scripture references: Jesus is the Messiah, Matthew 16:13-20; Peter’s betrayal, Luke 22:31-34; 54-62. After Jesus was arrested Peter followed behind to where he was put on trial. Three times he said he did not know Jesus. I knew he was the Son of God. someone who would always be there. Let us pray for all who are unfaithful to their friends that they – that we – may have the strength to stand up for those we love and the courage to apologise and rebuild our friendships. Jesus remember me, when you come into your Kingdom. April 6: Before the Cross XXII: Greater love hath no man. This image has always troubled me, since the day I first found a copy in a second-hand picture frame. This window is at Hythe in Kent, remembering a nineteen year old officer of the Royal Lancaster Regiment, Robert Aubrey Hildyard, seen dying at the foot of the Cross, his right hand on Christ’s feet, the feet Mary anointed with precious oil. At the foot of the cross lies Robert’s helmet, and a scroll reading, ‘Greater love hath no man’. We can all complete Jesus’ words: ‘Greater love hath no man than this, that a man lay down his life for his friends.’ (John 15:13). Robert looks peaceful, asleep, while once again we behold a risen Christ: alive, with good muscle tone; his wounds not bleeding. Robert’s rifle and bayonet and an artillery piece are behind the two figures; there is a hill of mud in the background and angels in attendance above. And scarlet wear the spirit of wár thére express. Hopkins recognises that the men are no plaster saints, but if a man wears a brave uniform we – and he – hope, we and he want to believe him as bravehearted as he is smartly dressed. But no-one was smart at the Somme, where Robert died. Their heroism was different: men drowned in mud or were cut down by machine-gun fire before coming to close combat. Robert himself was killed when a shell hit where he and Godfrey James Wilding were sheltering. Were I come o’er again’ cries Christ ‘it should be this’. For love Christ leans forth to kiss Robert and cry … ‘So God-made-flesh does too!’ What did God-made-flesh do in the War? He did not conquer death and sin with violence. I think of Jesus, asleep on the rugs in the sinking boat. A flimsy shelter, causing his friends to fear. Jesus sensed their fear, knew that death was close by, calmed the storm. But there was no dramatic rescue for Robert and Godfrey in this world, and no more that they could do. ‘It should be this’: not killing other men, but putting oneself in the firing line. Why did Robert and Godfrey lay down their lives? The gesture of touching Christ’s feet suggests that Robert’s parents wanted to associate his death with Christ’s, and saw it as freely given. We published his poem on the centenary of his death last July; click on the link. The post following that is Christina’s response to Kilmer’s poem: Is All Human Suffering The Same Suffering?. Do read that as well. I think Jesus might be dead… Or extremely close to death. The thought of His lifeless body growing cold terrifies me. Or of struggling to hear if He’s still breathing. Or hearing Him struggling to breathe. He has become nothing but weakness and pain and death. He has united Himself to us, even in our weakness and pain and death, even our oppression and victimhood. If you are united to the oppressed, you share their oppression. Jesus is completely naked. He is left with nothing hidden, no protection, nothing off limits. His last possession, His final mark of dignity, is stripped from Him. Here He is. The authorities were trying to expose Jesus as a fraud, as a pathetic, weak, failure. What they did instead, was expose the fullness of His love, in giving absolutely everything, absolutely all of Himself, to His wife, the Church. Nothing at all has been held back from His beloved. His mother is there, in the icon of Our Lady of Czestochowa, at the foot of the Cross. The blood from Jesus’ feet has run down onto her; she shares His death by her love; if He is bloody, she is bloody. In the icon, we can see the child Jesus: it is the same Jesus and same Mary, when Mary held Him in her arms, and when she stood at the foot of His cross. He is her child. Why have an icon of Mary in the image, and not just Mary? Because Jesus told us, “Behold, your mother”, and the icon is where we do that. Behold her. She is our mother, the mother of the New Creation in Jesus Christ. And at the foot of the Cross, in her sufferings she is giving birth to us, the Church. Behold your mother: know her and love her. Behind the cross we have the Church, led by Pope St. John Paul II (the Pope when it was painted, and also a great saint of the cross). The Church is at the foot of the cross, because that is where Jesus is. He gives His life to us on the cross, and that is where we must go to receive it. He unites Himself to us in our sin and suffering, and unites us to Himself in His obedience and glory. He offers Himself and us to the Father, and we must let Him. He unites Himself to us by sharing our death, and we must unite ourselves to Him by sharing His. Then there are the many crosses. The cross has gone forth through the world, and through it, the sufferings of the world are being united to Jesus and offered to the Father. Through the cross, the sufferings of the world are becoming love, and being borne with the hope of resurrection. The world is being divinised through its suffering. Jesus is either dead or nearly dead. He is pinned down so He can’t move. He is bleeding all over. He is physically torn apart by His own gravity. He is mocked openly by His enemies. He is stripped naked and put on display. He is annihilated. Evil has won. But it doesn’t have the last word. This image seems to show Satan’s victory. On the cross we see God fully under evil’s power, but in this, evil is overcome, because He transforms it into His own love. All of the power of evil is poured out on Jesus, and all of it is overcome by being transformed into Jesus’s self-gift. This post is from Ignatius, an old friend of Agnellus. Ignatius went to Poland for World Youth Day in 2016. 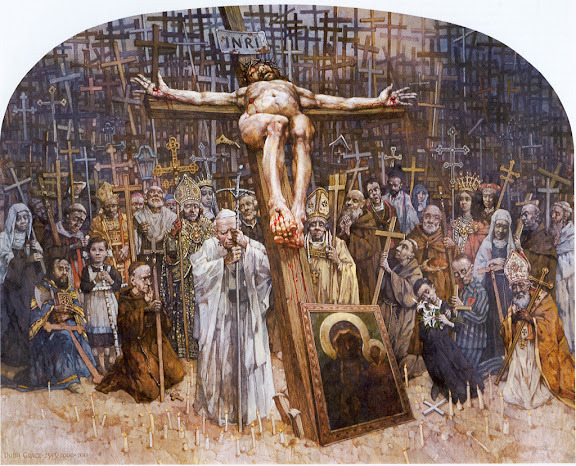 This painting is from the Stations of the Cross by Jerzy Duda Grasz at Jasna Gora in Częstochowa, Poland. As Ignatius says, this is not a risen Jesus, but these stations, like Ignatius’ reflection, do end in resurrection. You can find the full pilgrimage of stations here. I am very grateful to Ignatius for this reflection. There is room for us all before the Cross.